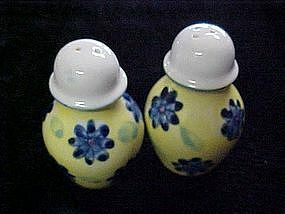 Sunny yellow shakers are made of porcelain and have bright blue hand painted flowers with a splash of green here and there. They measure 3 1/4" tall and are in perfect condition. Plastic stoppers.